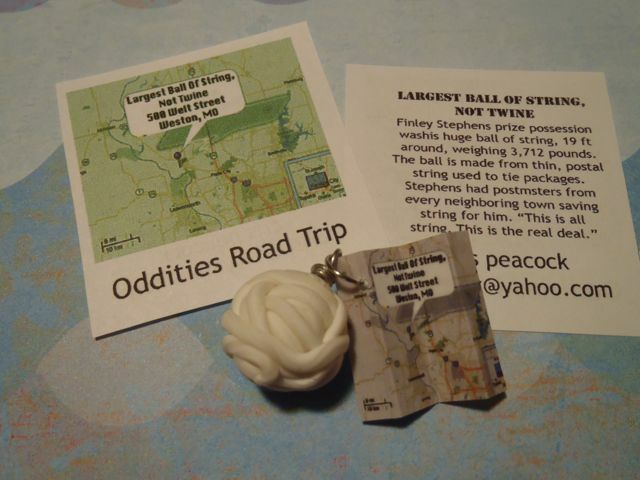 I made my ball of string out of Polymer Clay (great stuff!). Love how Mr. Stephens refers to his 'largest ball of string - not twine', always emphasizing the 'not twine' so there is no confusion! If you are ever in Weston, MO be sure to stop in to see it! My other Roadside Attraction featured a favorite place we use to visit on our way to Palm Springs. 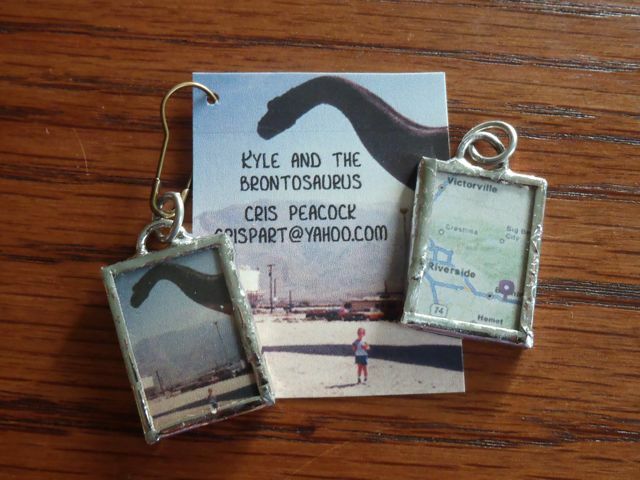 Along side the freeway stood two large dinosaurs - a Brontosaurus and a Tyrannosaurus. This photo was taken when Kyle was about 4 I think. He LOVED dinosaurs and could identify any pictures of them you showed him and tell you all about each one. His favorite bedtime book was a Dinosaur Dictionary... go figure :) But I do wish I still had that book since Sammy is showing the same interest now. He'd love it too. From what I've read about the dinosaurs in the desert, it seems someone has bought the property and now has it set up as a little park (that you have to pay admission to) and added more dinosaurs so it's not quite the funky dinosaurs just sitting off the freeway in the desert. Still would probably be cool to go see if you're in the area. 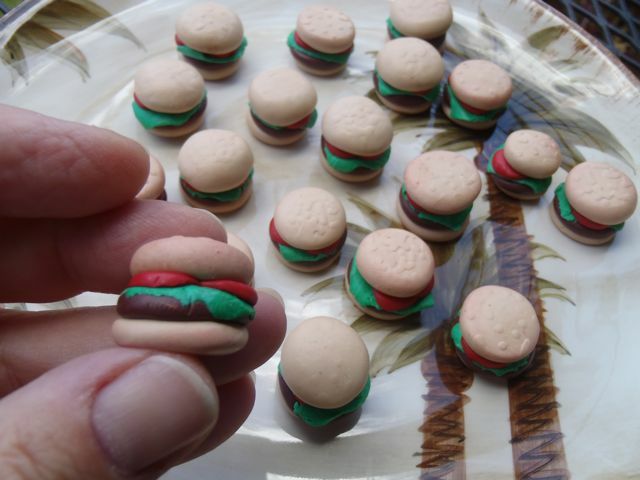 These cute little hamburgers were my contribution for 'Picnic Time' - they were also made with Polymer Clay. That stuff is great! So easy to use. I definitely recommend trying it if you haven't done so already. There has been some concern over it's safety since you have to cure it by cooking it. The companies that make it ensure the fumes are non toxic if cured as directed, not letting it get over a certain temperature. Just to be safe, I bought a toaster oven at a thrift shop and use an oven thermometer. Since our weather permits year round use of the lanai, I also cook it outside. On the mainland I used a dedicated casserole dish and just used our kitchen oven. That worked fine too. Aloha! Yep, it's been awhile....we've been crazy busy with friends and family visiting the island and we have taken full advantage playing tourists and travel guides and generally having a great time. 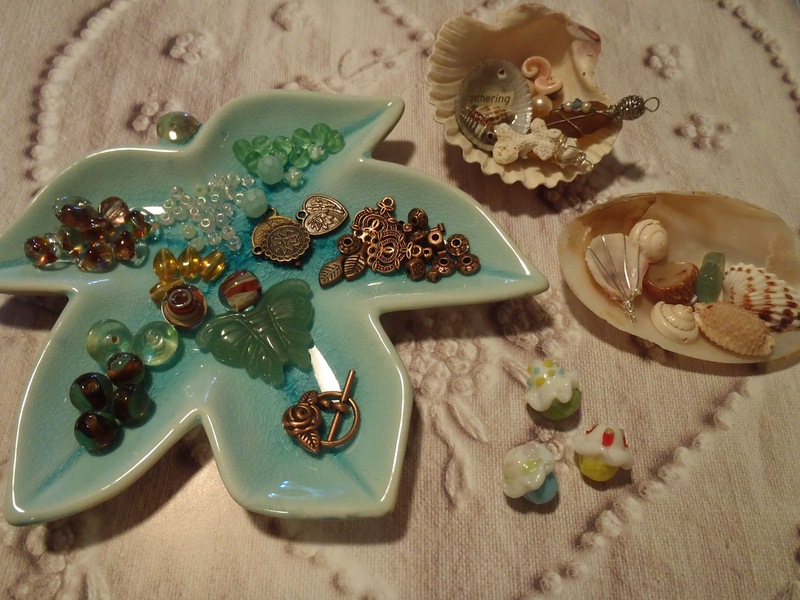 I have had time to play in my studio a bit as well and thought I'd share a couple of things with you on this pre Thanksgiving Day. 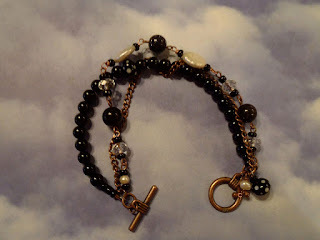 A recent swap was hosted by our oh so talented Dana James. You know all those great buttons sitting around tins or coffee cans from Grandma or Great Aunt Doris? 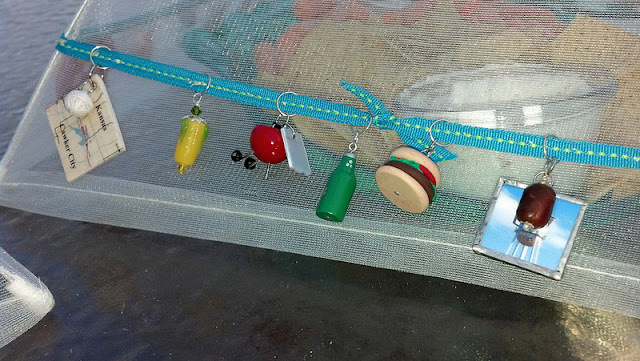 Well Dana thought we should dust them off and make some charms with them. What a great idea! I love the way it turned out. 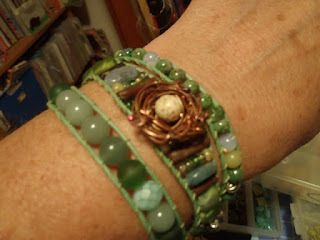 I used a heavy copper wire (16 gauge, I think) for the bangle part, curved it into a circle a half inch bigger than needed to slip over my hand. 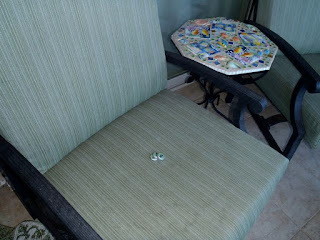 I flattened out the ends with a hammer and drilled two holes in each side. (I think the article said to rivet it but this was easier for me since my riveting skills aren't so hot) I started with the big button in the front and threaded a long piece of 26 gauge copper wire through the button holes and into the holes on the flattened part of the 16g wire, then started wrapping and attaching the smaller buttons in each direction ending towards the back. 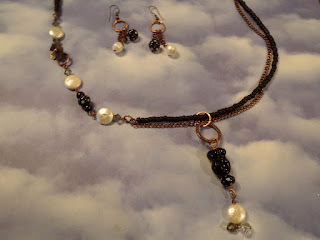 I did run out of the thin wire and had to ad more--just twisted one another long piece. You can kind of tell on the left side in the photo but it wasn't really that noticeable. I tried at first to use just a couple of wraps for each button but found the more wraps, the more secure the buttons were and they didn't slip around so much. To end it, I just tucked the last bit under some of the wrapped wire and made sure none was poking out. Pretty cute, yah? But wait.... 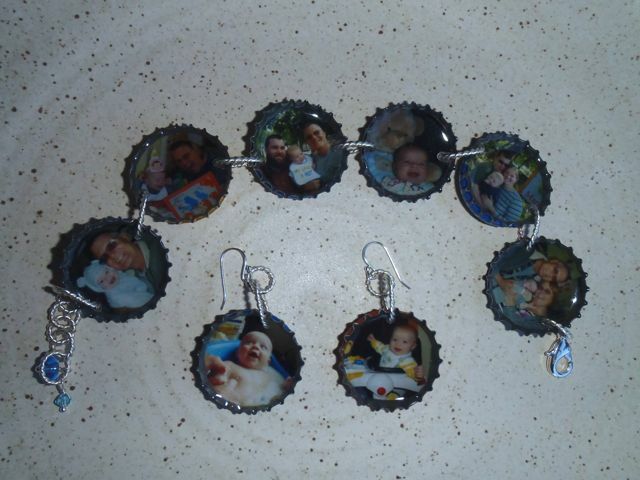 It's even better with everyone's cool button charms! 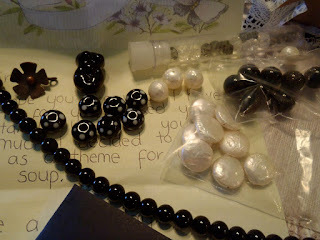 A BIG Mahalo to my Button Charm buddies and especially to Dana for hosting another great swap! 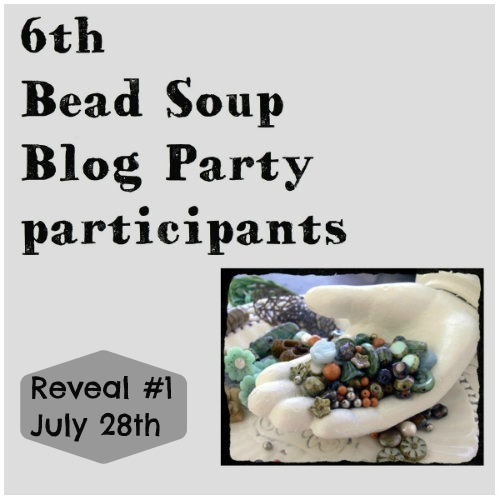 Bead Soup Blog Hop Party that is! Well, I'm fashionably late for the party :) It started at midnight East Coast time and here I am, almost 2 am your time...8 pm here in Hawaii. Are any of you really up and hopping now? I bet there are some of you! After you've looked through my photos, check my last post for the list of participants for this 'First Reveal' and see what amazing things party goers have created. I am always so impressed with the talented people that join in. And a BIG Thank You to Lori Anderson for once again putting together another wonderful party for us all--what an undertaking!! 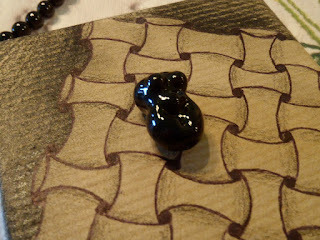 I just love the little lampwork glass Earth Mother focal bead Niky sent. Isn't she perfect? And those little white polka dot black beads are just the cutest ever. I used most everything Niky sent. Just a few treasures left for some special additions to other pieces. 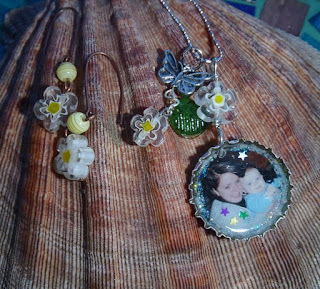 Necklace, Bracelet, and Earrings -- A perfect set for me! So....Get yourself a little something to drink and maybe a little snack, sit back and go visiting! Thanks for stopping by! Had to take a break from creating since I realized I haven't even posted my delicious Bead Soup from Niky Sayers of Silver Nik Naks yet. It finally arrived this week and was well worth the wait!!! It's difficult finding just what you want to send for someone's soup, especially if you've never met them or aren't familiar with their style and tastes. 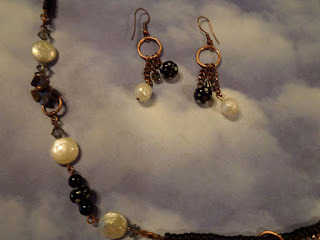 But that is what Bead Soup is all about--getting out of your rut, err, I'm mean comfort zone, and trying something new. Just look at all the goodies to play with--yum! It's hard to see in the photo but it is a lampwork glass torso! So cute :) It reminds me of the Venus of Willendorf; a little 25000 (give or take) yr old Mother Earth Goddess sculpture that you probably would never have even heard of unless you've taken numerous Art History courses haha. What a great focal!! 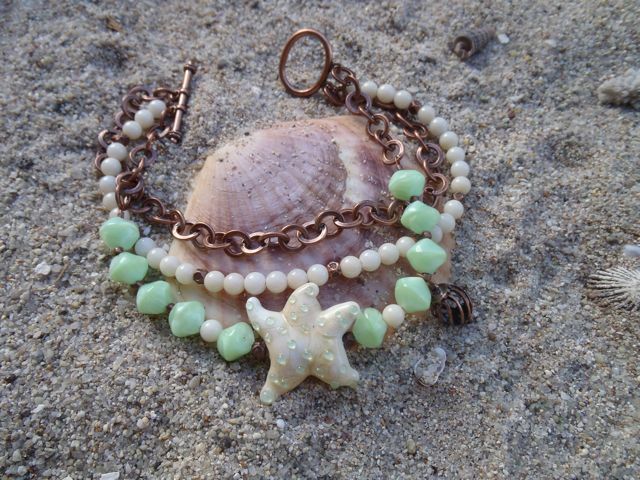 I'm having lots of fun with my treasures Niky.....MAHALO NUI LOA!! Be sure to check back tomorrow to see what I've made. 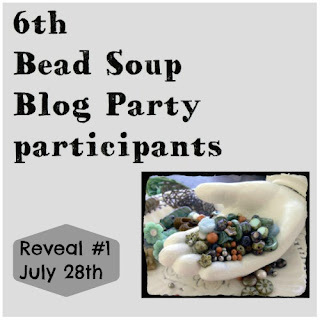 Midnight tonight Eastern Time is the First Big Reveal of the Bead Soup Blog Party....let's see, that is 6 pm here in HI--I'd better get busy and finish up! Below is the list of the first group that will be posting for July 28th. And if you have no idea of what this Bead Soup Blog Hop that I'm talking about is....Check out LORI ANDERSON'S Bead Soup Blog Hop site HERE! The beautiful lampwork sea star is from Dana that a friend of hers made. 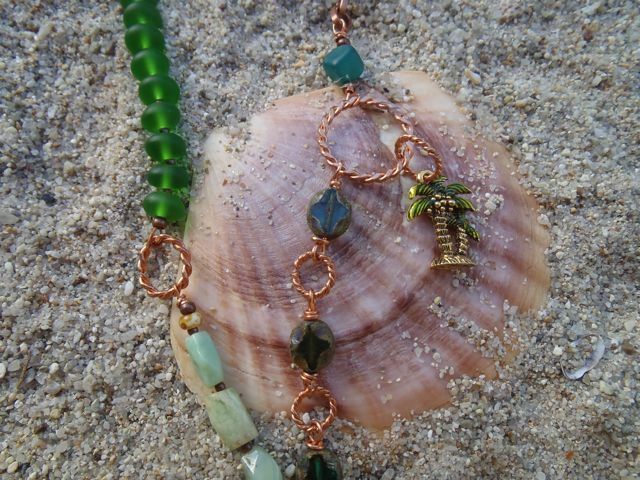 I just happened to have the light green beads in my stash that I had been saving for something special. They are exactly the same color as the spots on the sea star! 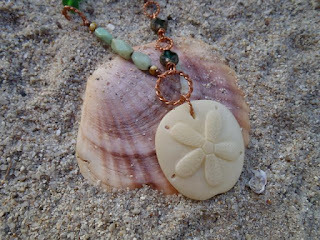 On the necklace below I used the wonderful sand dollar carved from a nut that Leslie sent. 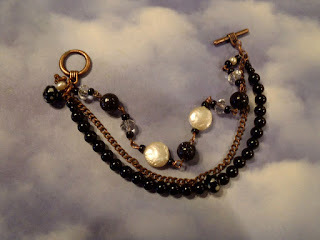 In both the necklace and bracelet I used Leslie's, Dana's and some of my own beads for accents. 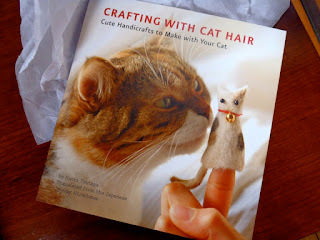 I'll let you know what the postman brings today!! 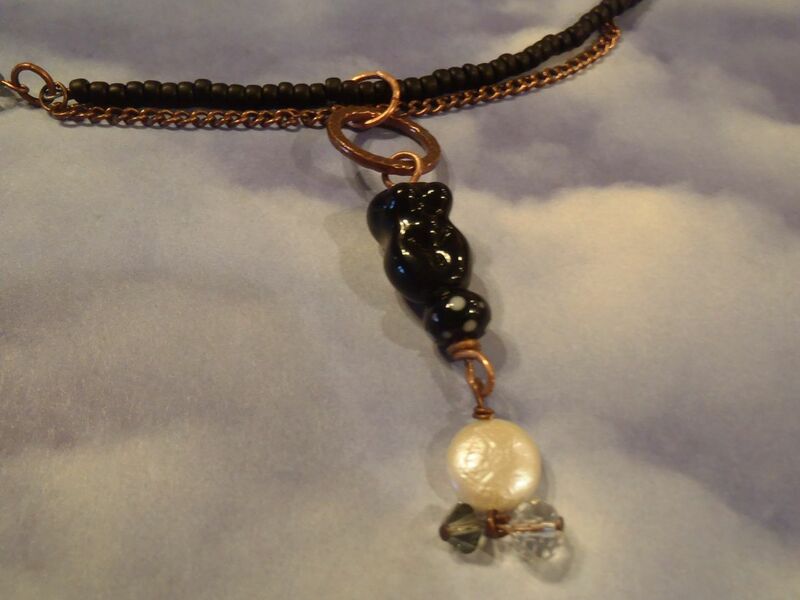 It's Bead Soup Time Again! Well....guess I'll head back out to the curb to wait for the postman :) Have a great day! 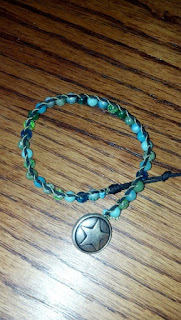 This one is about 24 inches to make the three wraps around my wrist. I like the look of the different sizes of beads. There are some silver and copper flower beads mixed in there too. Thinking there will be an ocean themed one coming shortly! 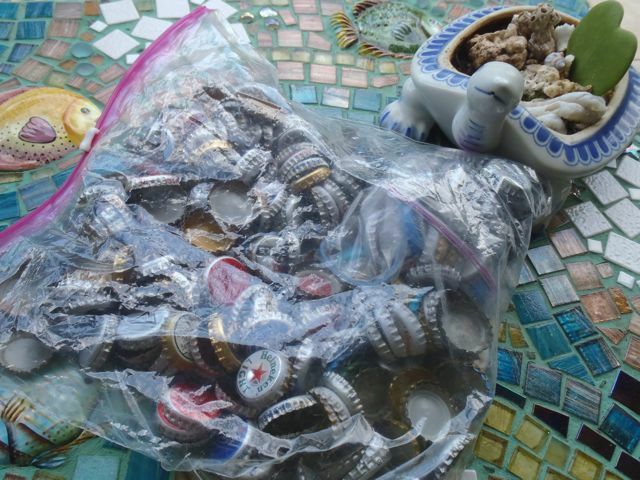 I sent Leslie some of my bottle cap beads in our Cup of Beads trade that she wants to learn how to make them. We will be doing a Skype class for those very soon. Wondering how it would work with a few people on Skype.... We'll have to experiment! 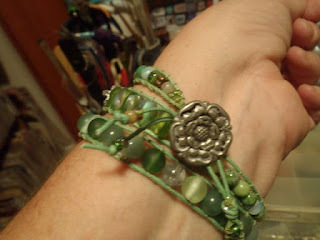 By the way--Leslie is a great teacher and she has other great teachers at her bead store from what I hear. 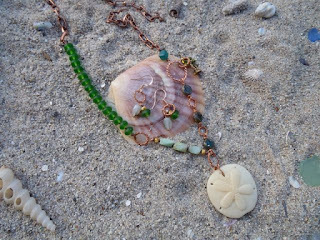 If you're in her part of Florida, you might want to stop in for yummy beads or to take a class! 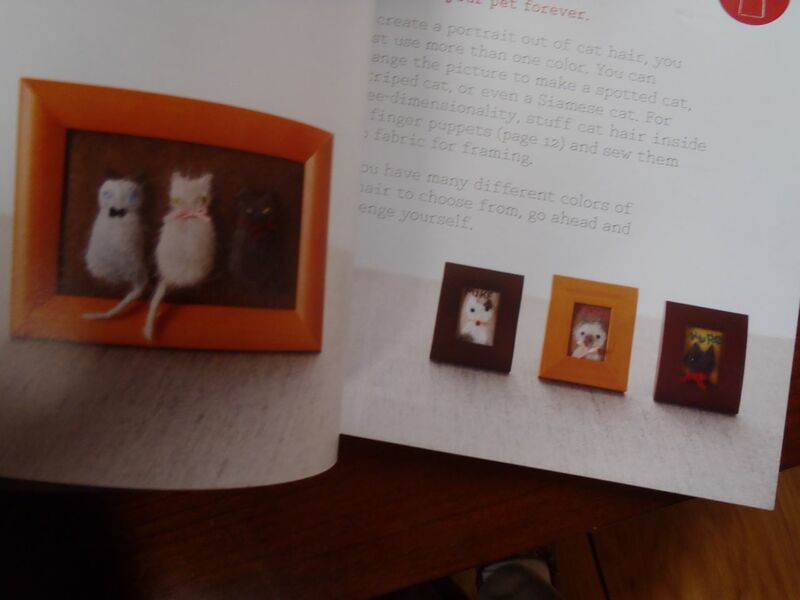 Have to share this great book I found with my art buddies who love to needle felt....and love cats too! Although the technique would most likely work with soft doggy hair or bunnies or hamsters or gerbils or mice, etc. but we all know CATS RULE! 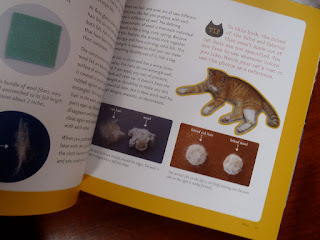 in addition to very clear instructions for needle felting. Aloha and Happy International Charm Day! We just got back from a trip for our grandson's first birthday. Great time had by all. Got home and realized I almost missed Charm Day! So here is a quick post with a couple of charm goodies. In my arm charm group (started by the fabulous Chris and Peg mentioned in earlier posts along with their wonderful Art Charm book) we had a recent swap with Zentangle Charms. Not sure what a Zentangle is? 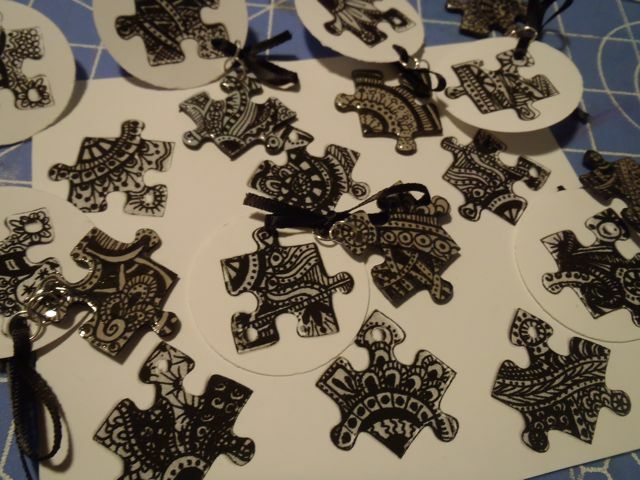 Little black and white drawings filled with cool designs--go HERE to see Rick and Maria's site. 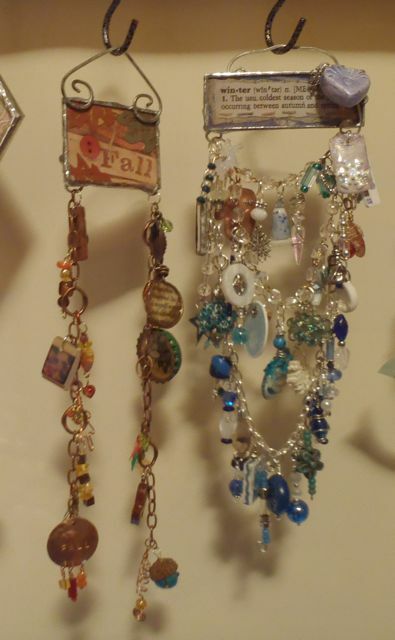 I wanted to do something different with my great charms. 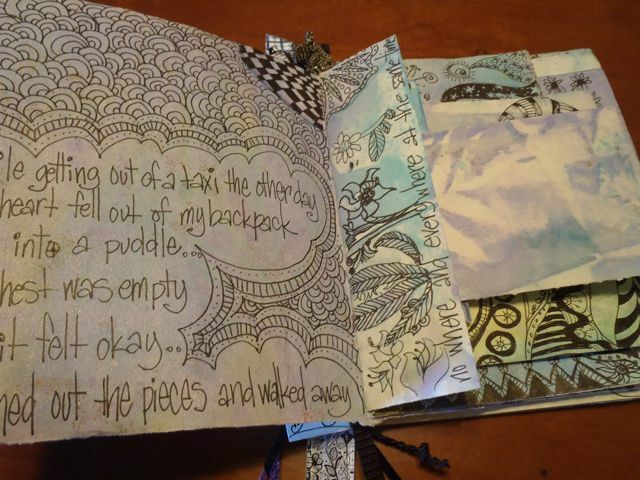 I have a little Zentangle book I've been playing in for awhile. 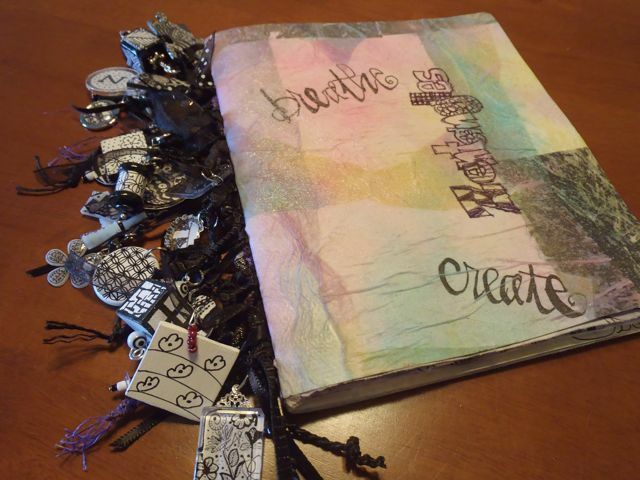 I made the book in a class with Traci Bautista years ago but never really worked on the binding. Another recent swap was our Winter Quick Swap. Martha, our host, has been hosting a little quick swap each season during this past year. I will be putting them together for a 'Season Mobile' when the year of swapping is finished. Here are some samples I've been playing around with. 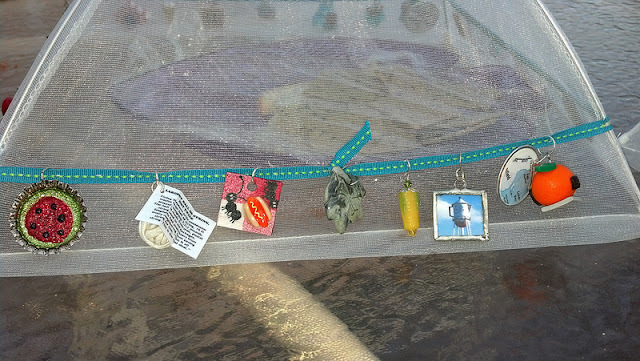 Since the swap was in groups of 5 charms, I added a few from other swaps that fit in with the seasons. I think the finished mobile will be way cool. Well, guess that's about it from me for now. 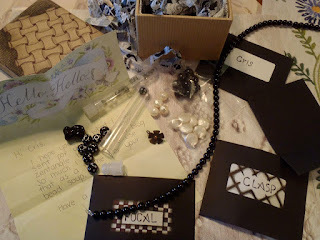 Be sure to check out Amber Dawn's Blog for more on INTERNATIONAL CHARM DAY -- our blog hop hostess. She has links to lots of happenings for the special day--charm give aways and sales from different Art Charmers. 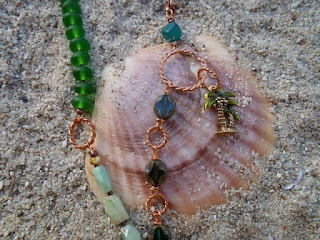 Don't pass up the chance to browse Amber's blog to see some of the AMAZING charms she creates while you're there. Enjoy!! Bottle Caps, Bottle Caps and more Bottle Caps! Aloha! Think this will be a long post since I have so many pictures to share. Maybe that will make up for not posting in so long :) Lots has been going on but somehow I don't seem to ever sit down to share things with you...sorry about that! I've been making several jewelry pieces but for now I want to share a combination of my two favorite obsessions.... my little grandson, Sammy and Bottle Caps. Last summer (check out the earlier posts) I had fun making some Sammy jewelry using Samuel Adams bottle caps. 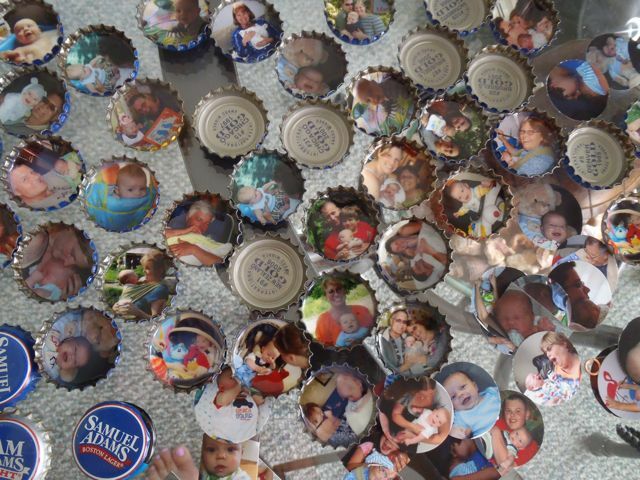 Since DH and I don't drink beer, I was having a hard time finding friends to drink enough Samuel Adams beer to have bottle caps to play with. After confessing I had poured some down the drain to get the caps, friends have been making sure I have enough to play with without ever letting that happen again!! 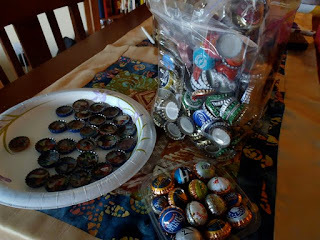 this nice, big jar of caps to play with--Woohoo! Have quite a collection of different kinds of caps now. I've been putting them to good use too. Some, I domed then soldered together and some I left flat, added photos, sealed them in resin. 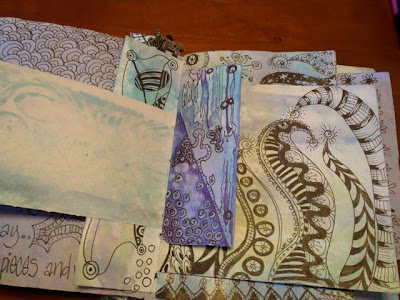 I also tried a new technique I found in the Nov. Cloth, Paper, Scissor magazine on a few where they are domed and covered with rice paper. They're pretty cool too. My favorites are the ones with Sammy photos of course! A bracelet and earrings for me and a set for Sammy's Mom, Keely. So...thought I give you a couple of pointers in case you'd like to try making some bottle cap goodies for yourself. 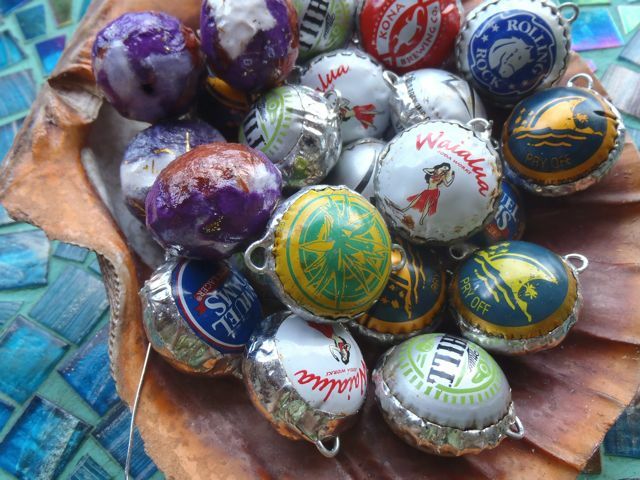 The first bottle cap balls I made were a bit smaller. 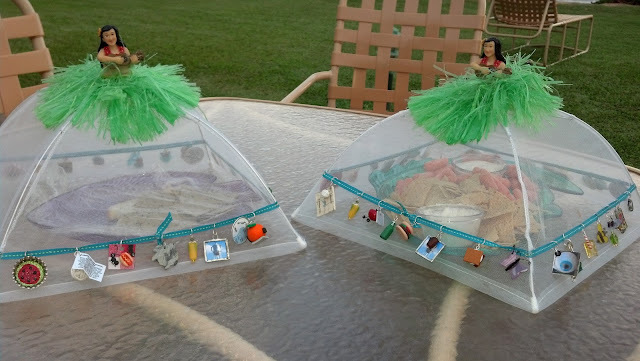 I cut the ruffly part off with tin snips before I domed them with the dapping block. If you are using tin snips, please, please, please, be careful! I got so many cuts from those sharp edges! You could probably use a metal punch set but it would have to be a really strong one to cut that thick metal. 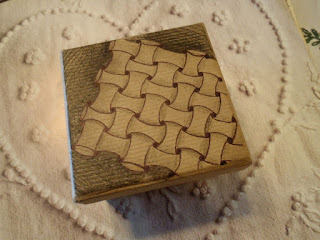 Here is a pic of the dapping block in case you're wondering what the heck that is! It's a clever little gadget usually made out of steel with several sizes of concave half circles. Using a hammer, steel punches of corresponding sizes are used to form a flat piece of metal into curved shapes. 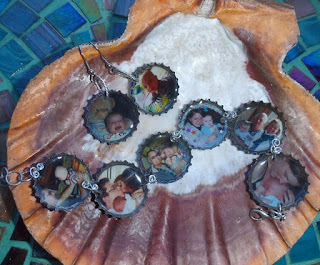 On those first ones, I started with the largest half circle and worked my way down until I had it domed to the size I wanted. Took forever! Later found that you don't really need to start out larger--just go with the size you want and go slowly. I tried some without trimming off the ruffle and think I like those better. Just so plump and fun! Next I held the two halves together and sealed the edge with copper foil tape and soldered them together just like you do when you're making a Stained Glass piece. 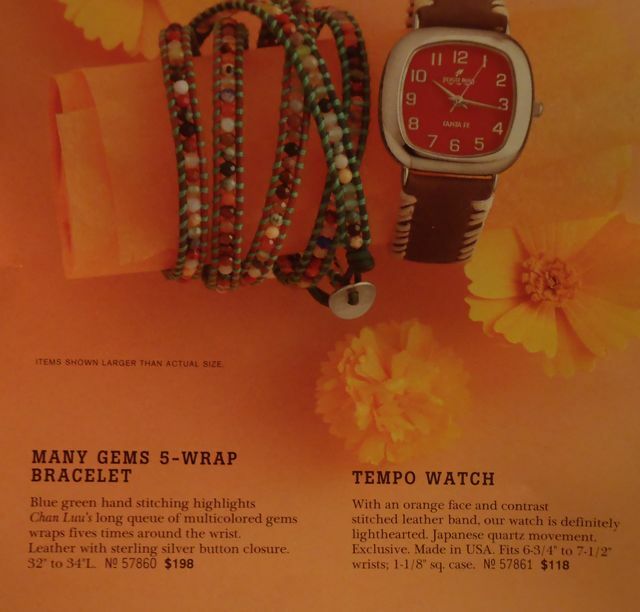 (Always use solder that does not contain lead when you're using it in jewelry or anything that would touch your skin). Be sure to burnish the foil well to the metal. 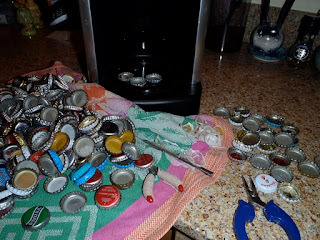 I found a great tutorial on YouTube (sorry, I couldn't re-find it to give credit to the right person) on how to remove those pesky plastic liners from the inside the caps. She used a little hot plate like you use for keeping your cup of coffee warm at your desk and set the caps on for a few seconds each. For the ones she was doing, she left one cap on the warmer for 7 seconds and another brand for 9 seconds. Can't remember which ones she was using, they weren't ones I have in my stash, but I was surprised different ones took different times. Sure enough, each cap brand behaves a bit differently. One Hawaiian brand beer cap just kind of melted away, some just popped off easily, and others took a bit of tugging. Instead of using a coffee cup warmer (since I don't have one!) I used the heating plate of our coffee maker. I just put several caps down on the warming plate instead of doing them one at a time. 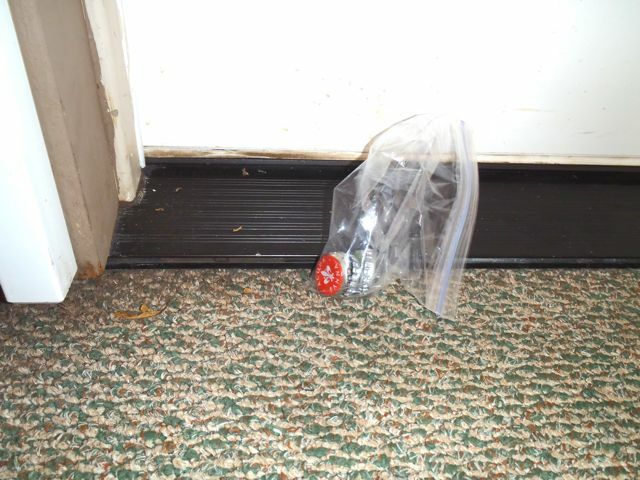 Picked the cap with pliers after it heated up and grabbed the liner with a needle tool and lifted it off. 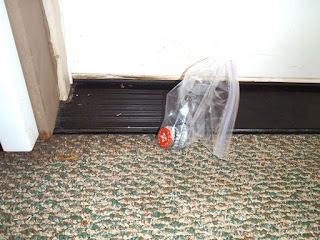 The caps do get hot so don't grab them with you fingers! Got those liners off in no time!! 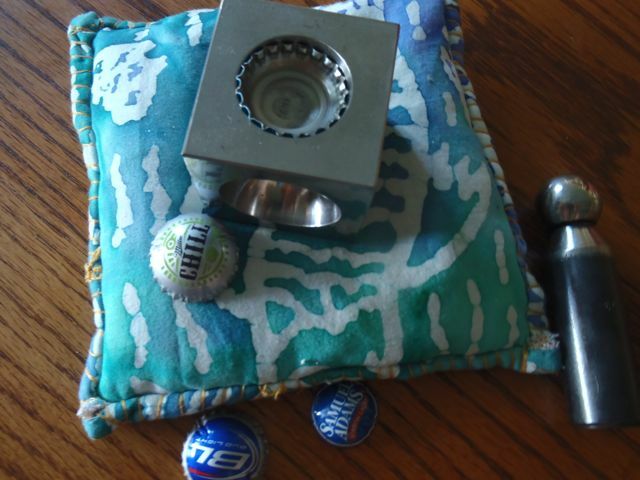 Hope this inspires you to up-cycle some bottle caps!